The Internet of Things is growing considerably as more objects gain connectivity. Everything from cars to coffee makers is becoming network enabled, and IoT capabilities offer new business opportunities. Gartner forecasted that 8.4 billion connected things will be in use this year and will reach 20.4 billion by 2020. The growth of IoT isn’t a futuristic trend on the horizon – it’s very much here, and organizations must be ready to leverage it. Inventory management is one of the biggest challenges within supply chain operations. Organizations not only have to ensure that they have enough materials on hand to fulfill orders, they also must place orders strategically for timely supply delivery. If shop floors are using manual or legacy tracking methods, it’s very easy to record numbers inaccurately. This will create problems for purchasing more materials and scheduling shipments. 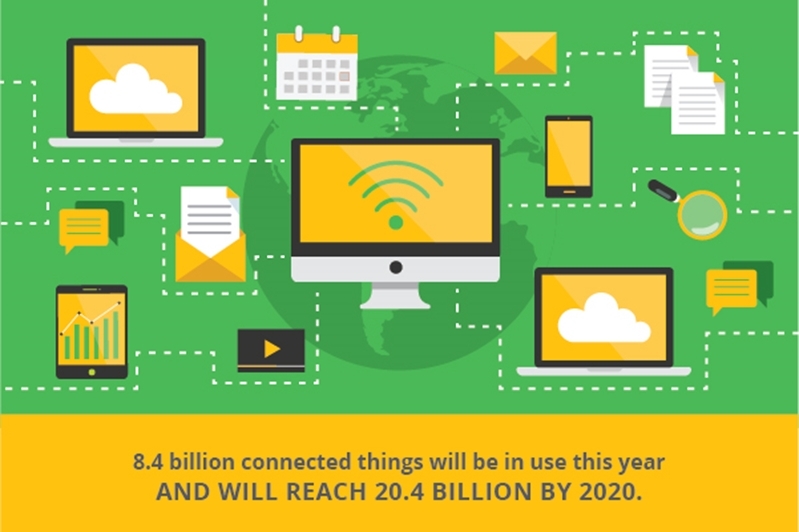 There will be 20.4 billion connected things by 2020. IoT offers a major visibility upgrade for inventory and warehouse management processes. Business Insider’s Andrew Meola noted that active and passive RFID tags provide data on items, and internet-connected trackers enable companies to track items throughout their delivery journeys. Beacons and Bluetooth can be leveraged to monitor data in more confined areas, such as a warehouse or shop floor. These sensors and trackers provide a more accurate picture for inventory levels, free from human entry errors. When inventory or products are being delivered, it’s important to ensure that they arrive intact and useable. However, things can go wrong during shipping, causing some items to be unviable. Supply Chain Brain noted that network-enabled sensors can be installed in warehouses and vehicles to track humidity, temperature, spills and unusual motion. Any unusual behavior will trigger real-time remote alerts to address the issue quickly. This will help maintain the optimal conditions for shipments and prevent items from getting damaged. Sensors could also be essential for monitoring hardware and ensuring that they’re working appropriately. If equipment is being overworked or is acting strangely, it could become damaged and impact goods. IoT-based sensors can recognize irregularities and allow organizations enough time to repair hardware appropriately. Data from IoT sources will drive preventive maintenance initiatives and minimize potential downtime within the supply chain. For smaller business, it can be difficult to do everything with a limited amount of people and resources. However, automation can ensure that certain repeatable processes are performed regularly, without the need for manual execution. Material Handling & Logistics noted that IoT affords better visibility, insight and guaranteed uptime, which will lead to better overall control. The flow of information could enable devices to automatically adjust their operations, driving intelligent manufacturing and achieving a feedback loop for all interconnected data streams. With automation, supply chain processes can be completed more consistently and on schedule. It will allow employees to focus on other necessary tasks and drive revenue opportunities. In this way, the return on investment from leveraging IoT technology could be significant and can enable companies to continue growing. Like any other new trend, IoT should not be used for the sake of being used. It must be able to provide some value to your organization and its operations. TechTarget suggested asking what areas of the supply chain you want to improve and evaluate if IoT or other technologies can help solve the problem. It’s integral to use technology to help achieve goals and shape decisions. Study how others have been successful with IoT sensors and learn from past mistakes. Research and evaluation will be key to effective IoT implementation and use. Supply chains are made up of a number of moving pieces and it can be difficult to keep track of it all. IoT will drastically change supply chain operations by solving critical issues, automating processes, monitoring goods and providing detailed inventory management. To find out more about how IoT can benefit supply chain operations, contact Inspirage today.